If you notice a sort of philosophic air to this post, let’s say that’s because life and death is swirling around Drink of the Week. People in my sphere are being born and others have made their last appearance after good and long lives, and that’s not all. This will be the final entry in Drink of the Week written before our departure from DOTW Central in exciting Van Nuys and our arrival at what we sure hope will be more permanent digs at DOTW Plaza in exotic North Hollywood. Expect a DOTW return to a more regular schedule in a few weeks. In the meantime, here’s maybe one of the very finest and also most crowd-pleasing cocktails we’ve done here. And, yes, it features Scotch. Such things are possible. I’ve been circling Blood and Sand, an infrequently revived classic, apparently named for the hugely successful 1922 bullfighting melodrama (viewable via YouTube), for several months. I’ve been biding my time because I had figured out a true Blood and Sand almost had to feature the juice of a blood orange, a fruit which has a relatively brief winter season. Yes, most recipes simply call for orange juice, but now it’s clear to me that the juice of the smaller purple fleshed orange, which looks exactly like grape juice, is the life’s blood of a truly outstanding Blood and Sand. Regular OJ is also definitely an option, but we’ll get to the issues around that later. Combine the Scotch, citrus juice, Cherry Herring — a very delicious liqueur you’ll be seeing more of here — and sweet vermouth in a cocktail shaker with plenty of ice. Shake as vigorously as a toreador torturing a testosterone-laden bovine and strain into a not too small chilled cocktail glass, adding your orange twist. Feel free to reduce the ingredients down to 3/4 of an ounce if you want a smaller drink. If you’re a silent film fan, you can certainly toast the charismatic star of the first version of the movie, Blood and Sand, Rudolph Valentino, who famously had his own dance with death much too early. Or, you can simply toast getting to enjoy another day on this earth and being able to sample this super-spiffy drink. I’ve been doing a bit of research and it’s hard to find any solid info behind my assumption that blood orange juice was part of the original Blood and Sand, whenever and wherever it was made. The recipe that I basically stole from the prohibition-era The Savoy Cocktail Book makes no mention of blood orange, nor does Ted Haigh in his Vintage Spirits and Forgotten Cocktails. On the other hand, the cocktail enthusiast who contributed the Wikipedia stub on the drink specifically mentions blood orange juice, as do several bloggers. I think it’s very safe to figure that the original Blood and Sand had some real blood orange in it and it makes an enormous difference. The tangier flavor of the blood orange, which has a hint of grapefruit to it, is just the perfect balance for the sweeter ingredients, particularly the Cherry Herring. Although my picture doesn’t do it much justice, it also looks vastly better this way — a deep red, as opposed to a muddy orange. Speaking of Cherry Herring, it is typically used for the cherry brandy mentioned in a lot of recipes. This is confusing because brandy is usually a distilled spirit that’s a million miles from a liqueur. Apparently, somewhere along the way, cherry brandy, cherry flavored brandy, and cherry liqueurs have all become oddly interchangeable with, I guess, the exception of cherry-derived kirsch, or kirschwasser, brandy. In any case, Cherry Herring, a standby cocktail ingredient you’ll be seeing here again, has become the standard for a Blood and Sand. 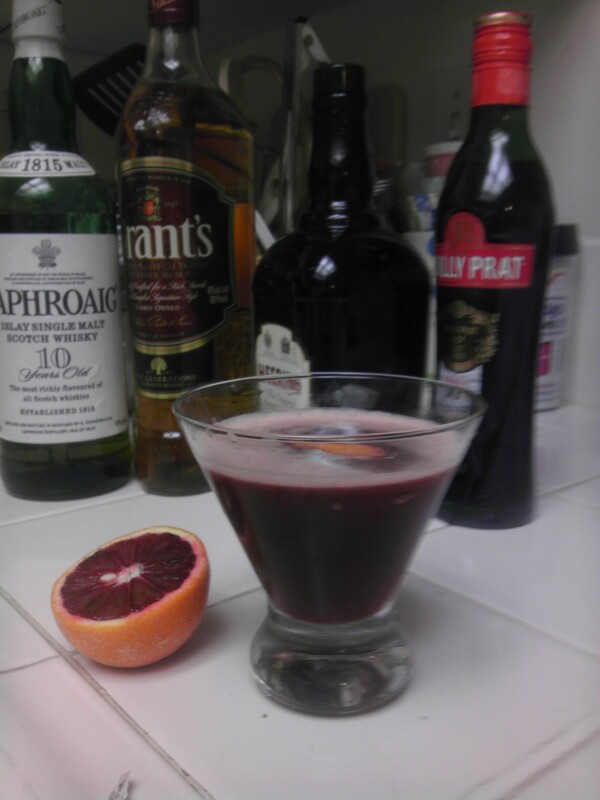 Getting back to my own adventures with this drink, whenever I used the blood orange, I found it pretty indestructible — sweet, of course, but with a nectar-of-the-gods sort of complexity to it. For my Scotch, I mostly used Grant’s, a very good, basic choice for this type of drink. (I’m sure any standard brand — Johnnie Walker, Cutty Sark, etc. — will also work just great.) Though some discourage the use of smokier Scotchs, I also found that the strong smoke flavor of Laphroaig 10 Year Old, featured here previously, added a very nice undercurrent to the drink; it also saved an unblooded Blood and Sand from being even slightly cloying when I tried it with regular orange juice. Ted Haigh proposes a slightly boozier alternative which I haven’t had a chance to experiment with as yet. He proposes an ounce each of juice and Scotch, but reduces the cherry liqueur and sweet vermouth down to 3/4 ounce, while adding a super-sweet cocktail cherry to the mix. Let’s all give that one a try when blood oranges finally go out of season.